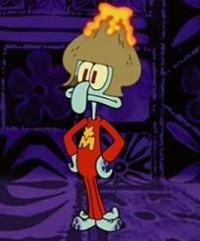 Captain Magma – From SpongePedia, the biggest SpongeBob-wiki in the world! Captain Magma is a superhero who is seen in the episodes Mermaid Man and Barnacle Boy V and The Bad Guy Club for Villains (as "Professor Magma"). He is part of The International Justice League of Super Acquaintances. He is briefly Squidward. He has the ability to shoot lava from his head. His costume seemingly is a red jumpsuit and a volcano hat which spurts out lava. Heat; lava will come out of his head if angered. Magma is triggered by the code word "Krakatoa!!!" Originally, Squidward did not want to be Captain Magma; however, Mr. Krabs forced him to because he said go save the world or he would be fired. Captain Magma is a parody of the Fantastic Four's Human Torch. He is called Professor Magma in Bad Guy Club For Villains, and is not Squidward's alter ego in the episode. This page was last modified on 4 April 2018, at 21:45. This page has been accessed 31,198 times.